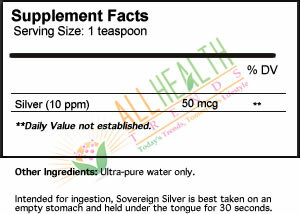 A Silver Hydrosol is a colloid of ultra-pure silver suspended in ultra-pure water. Even though other brands claim only water and silver in their formulations, this is hardly ever the case; one can find proteins, compounds, stabilizers, contaminants, oxidation and other ingredients, in them, which should never be present. Most amounts of "active" particles (96%) - confirmed by the University of Miami - particles are propelled towards their target. 3 rd Party studies prove Sovereign Silver to outperform all competing brands up to 500 ppm. What makes one brand of silver more effective than another? The biggest misconception in the market is that the more silver a product has the more effective it is. If this were true, then why do you think Sovereign Silver outperforms other brands with 50 times more silver? Science dictates that the most effective product is the one with more particles and surface area, and Sovereign Silver is the only brand with particle size documentation. 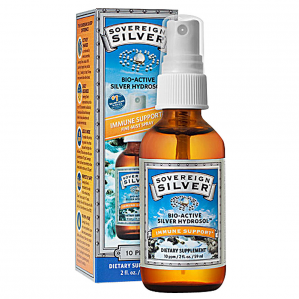 The use of silver as a respected preservative, disinfectant, regenerative agent and immune support mineral dates back thousands of years. In the early 20 th century it became the immune tool of choice by physicians. Then came antibiotics!